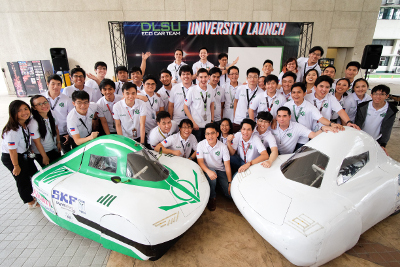 As part of its commitment to advance sustainable and renewable technology, De La Salle University’s Eco Car Team (ECT) unveiled its latest eco vehicles last January 26. The cars, “Bumakaya,” meaning “one load roar,” and “Imakadiwa,” which translates to “relentless warrior,” will take part in the upcoming 2018 Shell Eco Marathon (SEM) in Singapore. According to the team, the cars are 30-40% lighter, makes use of more exotic materials, are more aerodynamic, and have improved weight distribution. The student-led ECT has been competing regularly in Shell Eco Marathon since 2011. It has won two championships: for the category, Urban Concept Car (Battery Electric) in 2015 and the Drivers World Championship (Asia) in 2017. ECT has also won several first runner-up awards: In 2014, for the Urban Concept Car (Battery Electric) and Urban Concept Car (gasoline); and in 2016, for Urban Concept Car (gasoline). 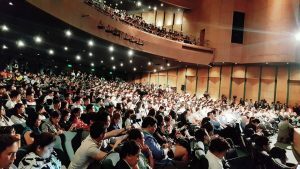 Alibaba Group Founder and Executive Chairman Jack Ma encouraged De La Salle University students to continue finding opportunities despite constant failures in an open dialogue last October 25 at the University’s Teresa Yuchengco Auditorium. Sharing that he was not a great student as he failed a number of times in his entrance exams, from primary school to middle school to college, he said that they should pursue the dream they are most passionate about. He likewise shared his insights and experiences about success and failures, the future of entrepreneurship, and his advocacy on social development. “How can young people have opportunities? We should enable them by technology and we should improve the education system,” he said, as he noted the importance of constant learning and development. In his conversation with DLSU students, he highlighted the importance of UN social development goals and mission and responsibility. He also shared some words of encouragement with the audience, which was comprised of students, educators, and leaders in the business sector. Best known for his innovation in e-commerce, Ma has received numerous awards from prestigious global institutions such as the “2015 Entrepreneur of the Year” at the Asian Awards and the “2009 CCTV Economic Person of the Year Award: Business Leader of the Decade Award.” In addition, Ma was named 30th Most Powerful Person in the World” by Forbes Magazine in 2014, “Business Person of the Year” by Business Week in 2005, and “World’s 100 Most Influential People” by Time Magazine in 2009. As a leader and philanthropist, he has supported and served in various advocacy and socio-civic organizations which include: being the Founder of the Jack Ma Foundation, Co-Chairman of Paradise Foundation, Special Adviser to the United Nations Conference on Trade and Development for Youth Entrepreneurship and Small Business, United Nations Special Advocate for the Sustainable Development Goals, and Member of the Global Board of Directors of The Nature Conservancy. 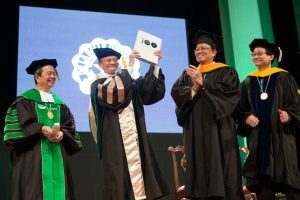 During the event, DLSU honored Ma by awarding him an honorary degree in Technopreneurship, honoris causa. “This is a great university with a long history and a great mission, and the thing that I feel most excited about is that this university carries the SDG or the Sustainable Development Goals. As one of the UN’s advocate for that, I feel extremely happy for our school to continue this mission,” he said. 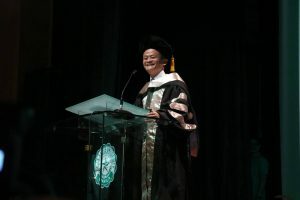 Other notable personalities who have received honorary degrees from DLSU in the past years include Nobel Laureate for Physics David Jonathan Gross, Nobel Laureate in Chemistry Richard Heck, former Timor-Leste President and Nobel Laureate for Peace Jose Ramos-Horta, Nobel Laureate for Economics Eric Maskin, Nobel Laureate for Economics Robert Mundell, Nobel Laureate in Literature Mario Vargas Llosa, former President of Poland and Nobel Laureate for Peace Lech Walesa, Nobel Laureate for Medicine Torsten Wiesel, former World Bank President James Wolfensohn, and Nobel Laureate in Chemistry Ada Yonath. Engr. Frederick Sison, CE Dept. 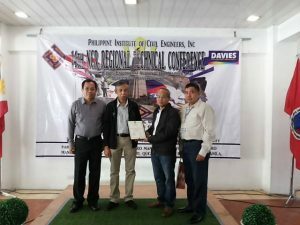 Professional Lecturer and past president of Association of Structural Engineers of the Philippines (ASEP) also delivered a lecture on “Updates on the National Structural Code of the Philippines. The conference was attended by PICE members from various MM chapters – Manila, Makati, Quezin City and East and North Metro Manila. There were 15 lectures on various topics – CPD, BIM, Codes, Retrofitting, Construction Management, Pile Dynamics, Gender Sensitivity, Transportation Engineering, Fire Technology Occupational Safety and Water Resources. From left: DLSU Office for Strategic Communications Executive Director Johannes Leo Badillo, University Student Government President Mikee de Vega, Yellow Boat of Hope Co-Founder Jay Jaboneta, and Mr. Miguel Lima representing Sen. Sonny Angara. 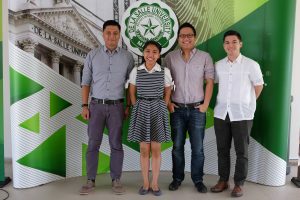 The Board of Judges meeting for this year’s Lasallian Scholarum Awards (LSA) themed “@youthPHL: Empowering the next generation through stories on youth & education” culminated last September 18 in De La Salle University, Manila. This year’s Board of Judges is composed of Sen. Juan Edgardo Angara, Al Jareera English News Correspondent Marga Ortigas, Knowledge Channel Foundation Inc. Trustee Raissa Posadas-Hechanova, Yellow Boat of Hope Co-Founder Jay Jaboneta, and DLSU University Student Government President Mikee De Vega. Now on its 14th year, the Lasallian Scholarum Awards aims to give recognition to outstanding coverage of youth and education stories by professional and campus journalists. The LSA has seven categories. For nationally circulated publications featuring youth and education concerns, the categories are 1) Outstanding feature article; 2) Outstanding column article; 3) Outstanding photograph; 4) and Outstanding feature story on De La Salle University. The other categories are outstanding feature on youth and education appearing in 5) National broadcast; 6) Campus publications, and 7) Online publications. Awardees will receive a sculpture designed by renowned artist Daniel Dela Cruz. The LSA will take place this October 23, 11 am, at De La Salle University. De La Salle University and Maynilad Water Services Inc. recently signed a Memorandum of Understanding (MOU) to undertake collaborative research projects that aim to address sustainable water management in the country. 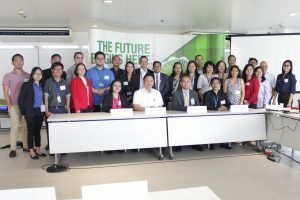 The MOU between DLSU and Maynilad was signed last September 4 at the DLSU Henry Sy, Sr. Hall, in conjunction with a workshop for the project “Water-Energy-Nutrient Nexus in the Cities of the Future” (NexCities) attended by international partners as well as members of the academic and industry sectors. The parties pledged full cooperation with one another to enhance their respective research capabilities in water and wastewater management. In the MOU, DLSU cited its aim to create a comprehensive support structure for research by establishing connections with industry partners and fostering research collaboration and creative activities with the industrial community. For its part, Maynilad expressed its desire to strengthen research partnership and linkages with the academic community by establishing activities aimed at promoting sustainable water management. The signatories of the MOU were Vice Chancellor for Research and Innovation Dr. Raymond Tan; Chemical Engineering Full Professor Dr. Michael Promentilla, who is the project leader of NexCities; Maynilad Water Academy Executive Director Rodora Gamboa; and Maynilad Senior Vice President Patrick Gregorio. 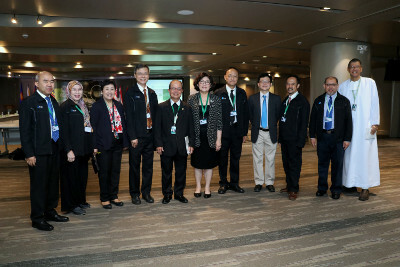 De La Salle University (DLSU) and the Department of Science and Technology- Philippine Council for Industry, Energy and Emerging Technology Research and Development (DOST-PCIEERD) hosted the “Water-Energy-Nutrient Nexus in the Cities of the Future” (NexCities) workshop last September 4 at the Henry Sy, Sr. Hall. The event was held in conjunction with the Newton Fund– Research Councils UK Project (RCUK). Representatives from the British Council, Newton Fund, Research Council UK, University of Surrey, University of Nottingham, and Maynilad were also collaborators for this event. The NexCities project aims to develop a new concept of Water-Energy-Nutrient Nexus in future cities that would help in identifying factors involved in energy and resource efficient wastewater management for improved water resources, enhanced water quality, sustainable food production using recycled nutrients, and positive social impact. The workshop aims to provide a venue for knowledge exchange among researchers and stakeholders from water utility agencies, civil societies, local government units, and other relevant sectors. 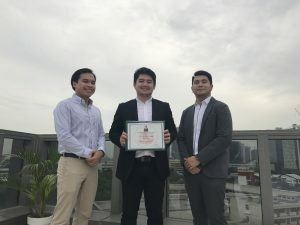 De La Salle University College of Law (DLSU COL) students bagged top honors in the recently culminated Vis East Moot in Hong Kong. The prestigious international moot competition took place last July 2 to 8. Theodore Dolar, Romeo Lanzarrorote, and Gavriil Sulano had a stellar finish, ranking first among all moot participants. The team from DLSU COL was able to defeat representatives from the Edith Cowan University of Australia, last year’s Vis East Moot champions. Lanzarrote was also given the Colin J. Wall Award for Best Mediator for the Vis East Moot Foundation Ltd’s 3rd Young International Mediation Competition. Competing universities are from Australia, China, India, Indonesia, and South Korea. Dr. Julio Teehankee, Full Professor of Political Science and International Studies has been elected as President of the Philippine Political Science Association (PPSA). This was announced after the first meeting of the Board of Directors on June 14, 2017. 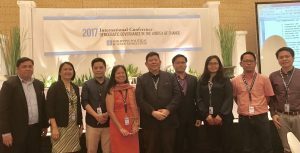 The new Board was elected in the Association’s recent Congress in Cebu last May 13, 2017. Associate Professor Ador Torneo of the Political Science Department was also elected Secretary of PPSA. The PPSA is a non-partisan, and non-sectarian organization of academic professionals founded in 1962 to promote and support the discipline of Political Science as well as maintain and encourage contacts with similar professional or scholarly organizations in the interest of mutual enlightenment. The PPSA seeks to bring together political scientists from all as well as similar fields of inquiry and practice both within and outside the academic setting in order to expand awareness and understanding of the politics of Asia and the study of all issues in the field of Political Science by Filipino political scientists. PPSA is a member of the Philippine Social Science Council (PSSC). Teehankee, who is completing his term as Dean of the College of Liberal Arts, is widely recognized in the fields of Political Science, International Studies, and Development Studies. He continuously holds leadership positions in prominent professional organizations in these fields. He was former President and current Executive Secretary of the Asian Political and International Studies Association (APISA), Asia’s leading academic organization dealing with political and international studies. He also serves as Adviser to the Association of Political Consultants in Asia (APCA), the professional organization of individuals in Asia that actively promotes political campaigns and communication, public affairs, government relations, and other similar professions involved in the practice of political consulting; and, the Philippine International Studies Organization (PhISO), the pioneering professional organization dedicated to the promotion of International Relations (IR) as a field of study in the Philippines. Teehankee also sits in the Technical Committee on Political Science of the Commission on Higher Education (CHED). He will serve as PPSA President for two years. Two months after its 13-17 March formal visit, a team of six assessors from the ASEAN University Network (AUN) has conferred upon De La Salle University the AUN Quality Mark at the Institutional Level. 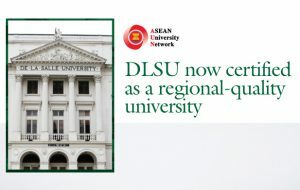 DLSU is the first university in ASEAN to earn the certification. The visit culminated a year’s preparation that required DLSU to submit a Self-Assessment Report as well as hundreds of documentary exhibits. During the validation visit, six of AUN’s most experienced assessors from Malaysia, Singapore, Indonesia, and Thailand toured the Taft and Laguna campuses, reviewed documents, and interviewed over 300 respondents, from the Brothers, Board of Trustees, President and Chancellor, to faculty, staff, students, and alumni. AUN assessors reviewed documents and interviewed over 300 respondents during their formal visit. They used the AUN’s framework for Quality Assurance at the Institutional Level. It comprises four key areas: Strategic (overall governance), Systemic (quality assurance systems), Functional (teaching, research, service), and Results (outcomes, including financial and market performance). These four areas are further divided into 25 criteria and 111 sub-criteria. To earn the AUN quality mark, an institution must score at least 4 out of 7 across all four key areas. DLSU was rated 5 (“more than adequate”) in Strategic, Systemic, and Functional areas, and 4 (“adequate) in Results. The certificate marks another quality milestone for DLSU, whose departments have been undergoing AUN-QA Program-Level assessment since 2008. By next year, half of DLSU’s departments will have had their flagship programs internationally assessed, by far the most in the country. AUN-QA was established in 1995 as ASEAN’s quality assurance network in higher education, responsible for promoting quality assurance in higher education institutions, raising the quality of higher education, and collaborating with both regional and international bodies for the benefit of the ASEAN community.